On March 23, Jim Sayers, the executive director of Adventure Cycling Association -- America's largest cycling membership organization -- will make a presentation on the joys of bicycle travel and cool projects happening at the national and state levels, including a new Underground Railroad alternate route through Michigan. The event will run from 7 to 8:45 pm and will be held at the International Institute on E. Kirby. Next up is a Complete Streets community education session on March 31 at the Gaelic League in Corktown. It runs from 6 to 8 p.m. and will be catered by Slows BBQ. Richard Wooten from MSU-Extension will give an overview of Complete Streets, what they look like and how they benefit everyone. It is hosted by the City of Detroit's Department of Health and Wellness, and you should RSVP by March 25 to Myra at tettehm@detroitmi.gov. Find out more about Complete Streets in Detroit here. We hope to see you at one or both of the events! Since we talked about bike rack design last month, we've gotten lots of questions about bike rack installation. So here is a handy-dandy guide to petitioning the city for the legal installation of one on a sidewalk outside your business. Copy the letter below and and fill it in with your info. RE: Petition for Right of Way Encroachment Approval to Establish / Install an Outdoor Patio / Bike Rack / Bench / Etc. along the Sidewalk on the east side of Woodward, between Temple and Charlotte submitted by Wheelhouse Detroit, LLC. Wheelhouse Detroit is a bicycle shop offering new bike sales, retail, service, bicycle rentals and tours. It opened in 2008, and is the only full-service new bike shop in Greater Downtown Detroit. Wheelhouse currently operates from March through November in a small space located on the Detroit Riverwalk at Rivard Plaza. This letter from Wheelhouse Detroit requests a petition number to grant approval for a right of way encroachment to install a bike rack along the sidewalk along the east side of Woodward Avenue, between Temple and Charlotte. Attached you will find the specification cut sheet for the bike rack to be installed as well as a measured drawing indicating the as built location of the bike rack. As the petitioner, Wheelhouse Detroit understands if the right of way encroachment is approved, Wheelhouse Detroit must enter into a maintenance agreement with the City of Detroit to accept liability for the encroachment and ensure the proper maintenance of the rack. Please feel free to contact me at 313.656.2453 should you require any additional information in order to proceed. Thank you for your consideration of this matter. Attachments: The cut sheet isn't necessary, but a site plan is -- you'll just need a measured drawing that shows the building, where the fence for the patio or the bike rack will be installed, where the right of way is (sidewalk, street, property line). For this, it doesn't need to be to scale, but it should indicate the measurements. Maybe throw in some photos of the site. You submit the package to the City Clerk and in about 2 to 3 weeks you'll get a petition number and someone from the City will contact you, more than likely the Survey Bureau from the Department of Public Works. They will assist you in processing your request, but they need a petition number to start. Again, feel free to contact us at info@wheelhousedetroit.com for advice or assistance. 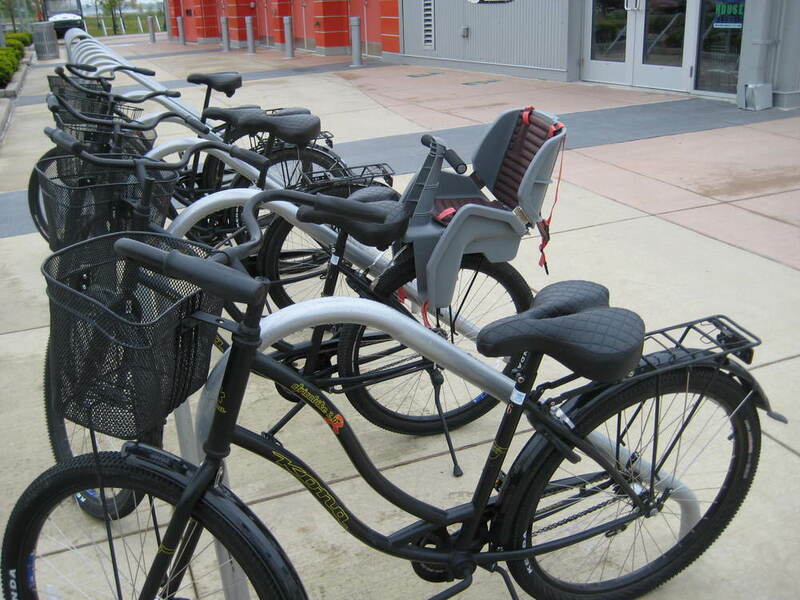 We love seeing bike racks sprouting up around town, especially when they are done well! Thanks to League of Michigan Bicyclists and other coalition members for their efforts on garnering support for Complete Streets at the State legislative level. Check out their latest recap here. There will be another hearing for Complete Streets up in Lansing on June 10. Our friends with the coalition are doing great work, but make sure your legislator knows that his or her constituents support this. There are organizations pushing hard against it, so we need to remain vocal. Follow their work here. Our June tours feature some old favorites (Eastern Market, Architecture, Grandmont Rosedale and Creekside) as well as some newbies (Gallery Scene, Family, Public Art). They are starting to fill up, so check your calendar and choose one for the month! Read more and register here. As Detroit becomes more bike friendly, more and more businesses and institutions are installing bike racks -- which is great, no doubt about it. What is frustrating, though, is to see funds and good intent wasted when, simply put, the bike rack is not functional. This occurs when the rack is poorly designed or poorly placed. The sad thing is that it is not inherently more expensive to buy a properly designed rack, or even build one. A great example of a do-it-yourself rack is at the Woodbridge Pub. It uses varying lengths of metal pipe and couplers for a functional rack that even has a cool industrial look to it. There are several standard racks that are great: The post and loop, which you can find at Mudgie's Deli and the simple inverted-U, which can be seen below. Landscape Forms, which is a Michigan-based company, makes a couple of very functional racks with pleasant designs. The Pi is a take on the inverted-U and the Bicilinea is based on a design you might see employed in Europe. We really like how the angle makes it easier for many frame sizes to lock up to the rack. Another great basic design can be seen right here at Rivard Plaza. (Not at all our doing!) There are lots of them, they are well-spaced and well-placed! This rack is a step up from the inverted-U and the post and loop because the angle, like the Bicilinea above, accommodates many different sizes and shapes of frames. They do take up more room though, so if space is limited go for the inverted-U or post and loop, which are both perfectly adequate. Onto the bad. The wave rack, which can be found everywhere. Why is it bad? Unlike the inverted-U, there is only one possible connection point to the frame of a bike. The frame is the point, people. It's the most valuable part of a bike. The worst bike rack of all is the classic "comb" rack, the kind you probably used at elementary school. There's one of these at the Coleman A. Young Municipal Center as well as at the Broadway People Mover Station. There is no place to lock a U-lock to, except at either end, and all the interior spots are great -- if all you care about is your front wheel. Say no to comb! Here are some links that talk about good and bad examples of racks, they really help you get the idea. One last quick note. Designing your own rack, whether to save money or to add a creative bent to a functional item, is awesome. And totally encouraged. Just make sure to consider the goal of the end object: something to lock a bike to. If that sounds obvious, well, you should see some of the racks out there. 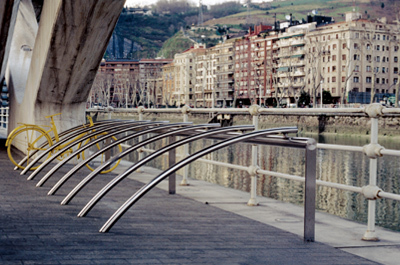 They look rad, but if you can't lock your bike to it, it's just an ornamental sculpture. A prominent example of artsy racks can be found in NYC, where David Byrne, an avid cyclist, designed nine iconic racks. That, importantly, also work. If you are thinking about installing a rack - yay! - swing by the shop or shoot an email to info@wheelhousedetroit.com. Kelli and Karen have tons of information on styles, specs and prices.